Sean Hannity devoted the top of his show Monday to a rant about the big news of the day: the FBI’s raid on the office of Michael Cohen, Donald Trump’s personal lawyer. 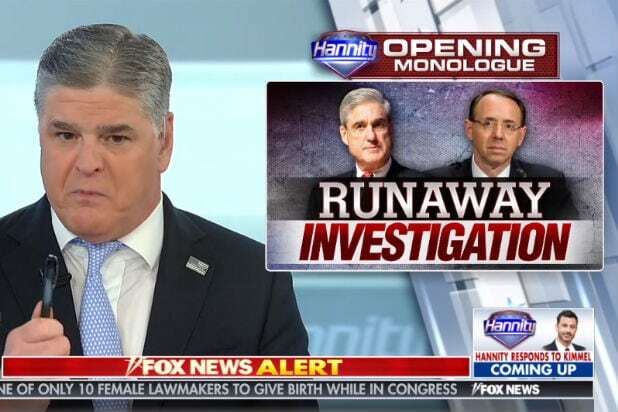 “Mueller’s witch hunt investigation is now a runaway train that is clearly careening off the tracks,” Hannity said during his opening monologue. Hannity also took exception to Cohen being roped into Mueller’s investigation on the grounds that Cohen is not involved with the Trump administration in an official capacity. Before moving on to other topics, Hannity summed his comments up like so. “Robert Mueller is so far beyond his mandate. This is now spiraling out of control, and everything we have warned you about is now coming to fruition, and Mueller has ostensibly tonight declared war on the president of the United States. Clearly his objective is to remove him from office,” Hannity said.